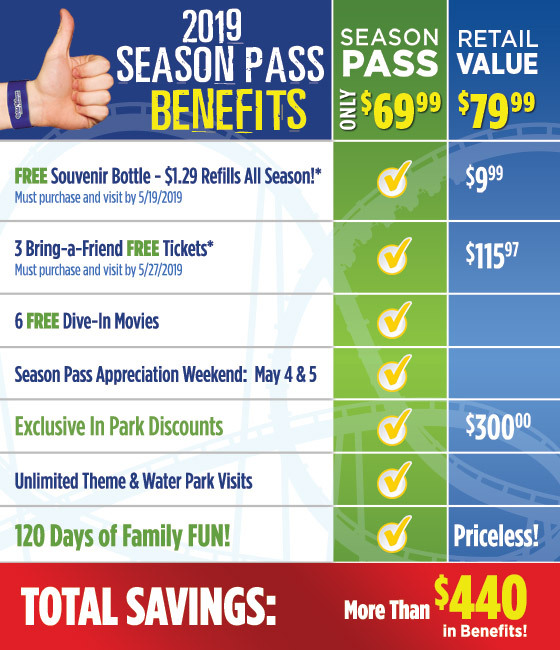 BEST VALUE - A Season Pass pays for itself in less than two visits! Unlimited Theme & Water Park Visits! *Visit by dates will apply to receive some benefits. *Season Passes can only be processed at the Season Pass Processing Trailer when the park is open and operating. Please see our Park Hours for more information. PLAY-AWAY WITH EASY PAYMENT PLANS! Please use the below login to manage your payment plan for your 2019 Season Pass. If you have already purchased, and have made your initial payment on a payment plan, please use the below log in to manage your payment plan. Example: If your billing information changes prior to the date your payment is due, please use the below log in. Please Note: The following information is required to look up your order: Order Number and Email Address. Once payments are completed, you will be unable to log in any further. If a payment is rejected by your credit card company, you will receive an email from us notifying you of the failed payment. Please update your payment information by clicking on the login button above. Failure to process a payment, as indicated on your payment notification email, will result in the suspension of the item(s), and you will not receive the item or package until your payment is made in full. All payments must be received prior to park opening date (May 4, 2019). If your billing information changes prior to the date your payment is due, please click on the login button above to update your records. For Online Purchases Only. Technical support is provided by telephone 24 hours per day, 7 days per week. Please note that Technical support agents cannot provide: event specific information such as hours of operation, detailed information about the benefits associated with tickets and season passes, or refunds. Please email info@wildwaves.com for specifics. If you wish to speak with a technical support agent, please call 407-261-4284. Warning: Fraudulent tickets are being sold on Craigslist, eBay, and OfferUp. Tickets or Season Passes NOT purchased from Wild Waves Theme & Water Park’s Website or other approved partners in person, may be counterfeit and are NOT valid for admission. If it is too good to be true, IT IS!